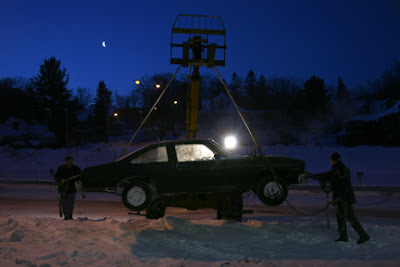 At 7:30 this morning Andy Niemi arrived with his crew to place the Nova perfectly in its freezing chamber. In just a few minutes the crew had the Nova mounted & hoisted into the box. It was perfectly choreographed by Andy and it happened without a single glitch. I don't think there could be a more romantic image than this Nova at dawn. It takes my breath away. Punxsatawny Phil must be jealous. I most definately agree, I had one like this in blue and it brings back GREAT memories. Hmmm, we haven't heard anything from the Ice Princesses since last Friday. Did we have a big party weekend or have we been working hard? How did you know that Mary was from Punxsy?? 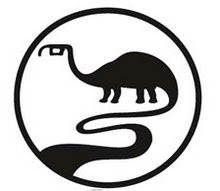 Looking forward to meeting you when you get here ... Stop by & introduce yourself . . . I didn't know Mary was from Punxsy! How cool. I shouldn't be surprised. I surely wish I was gonna be there in person to see this, but cannot make it this year, boss is being a bully and won't let me have the time off. Can you keep the Nova on Ice until May, LOL!! I gotta pick up the boy then, JK! Love the new webcam, I will be watching! Cannot wait for the reveal! I can't believe you all had to change your resting time to coincide with nature....You are all very committed!